ANZMAC is on social media! Our Mid-Year Doctoral Colloquium, June 13-14 2019, will be hosted by the Department of Marketing, Macquarie University, Sydney NSW. Please see further details here. This GAMMA event, 9-12 July 2020, will be hosted in Seoul, South Korea. Partners include the American Marketing Association, the European Marketing Academy and others. The submission deadline is 15 January 2020. Please see further details here. This is nice work by Professor Geoff Soutar at The University of Western Australia, which lets us benchmark by academic level within Australia and New Zealand (ANZ). 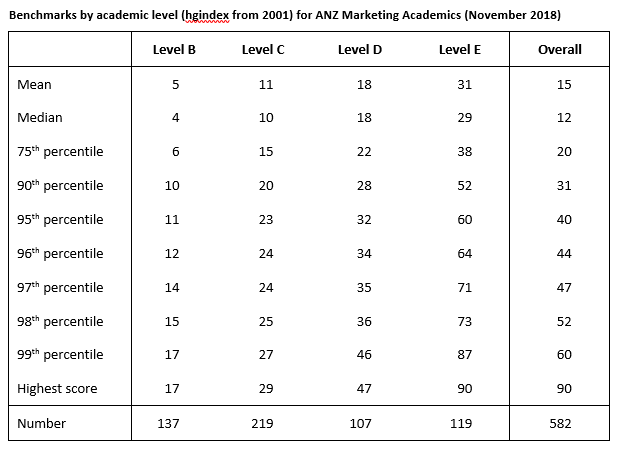 It updates benchmarks provided in Soutar, Wilkinson and Young (2015), but is only based on ANZ marketing academics’ research impact. The hg-index combines the h-index and the g-index. The h-index is the number of papers that have at least that number of cites, so that an h-index of 10 indicates an author has published 10 papers with 10 or more citations. The g-index is the rank number of articles (g) for which there are g² number of citations. Combining the h- and g-indices ‘presents a concise picture of a scientist’s achievements in terms of publications and citations’ (Rousseau, 2006:4). The hg-index is the geometric average of these two metrics (Alfonso et al., 2010). For more information, and for an international comparison, please see Soutar et al. 's (2015) paper in AMJ.